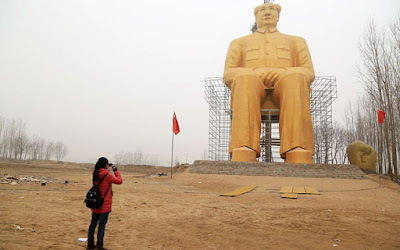 A giant statue of Chairman Mao Ze Dong that was built in a poor part of China nearly 40 years after the Communist revolutionary’s demise has been torn down after it became the subject of ridicule. The model of the Chinese revolutionary leader is 36-metre in height, built from steel and concrete and glowing with a coating of gold paint. It was built near the village of Zhushigang in Tongxu county, Henan province, where Mao's policies were blamed for deaths of millions. The Mao statue cost a reported 3m yuan (£310,000) which was primarily donated by entrepreneurs and also by local residents.